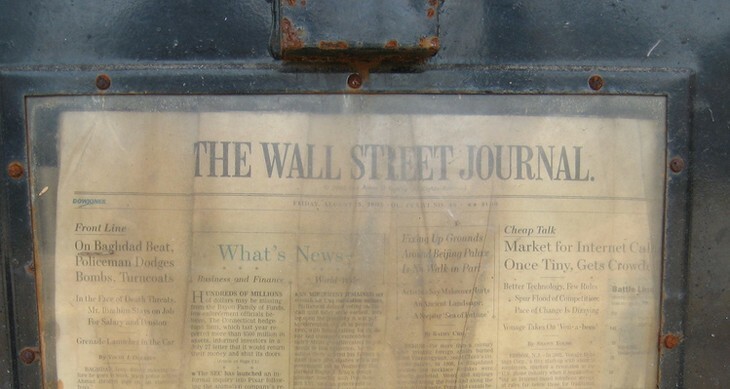 The Wall Street Journal (WSJ), has finally joined many other mainstream publications on Apple’s Newsstand. The pale pink business pages are now available after the paper resisted joining for some time. As All Things Digital points out, putting the publication on the ubiquitous Newsstand means that Apple keeps 30% of all in-app sales and retains control of customer billing information. With so many readers now picking up tablets like the iPad, excluding titles and dealing with separate costs can do some damage. But as most of us are watching the evolution of news publications with interest, how the game plays out in the long run is difficult to predict. The WSJ subscription is available in two flavours. For smartphone users the tariff is $12.99 and all digital access for iPad, iPhone and to reads the WSJ.com subscribers exclusive content, users pay $21.99 per month. Through Newsstand, WSJ will automatically arrive on devices overnight and if readers allow the feature, breaking news alerts can also be enabled. Both of these things will be a boost as they attract reader’s attention and of course without appearing on Newsstand, these features would not be available to the publication. At the very least this move may open up the publication to a fresh audience, though digital access through iOS apps and while traditional news publications are suffering, trying something is often better than doing nothing when it comes to reaching a paying audience.